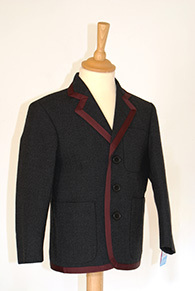 Our prestige range of blazers are made from many different fabrics, most are UK woven, all from within the EEC. We use high quality fusibles and shoulder pads and have strict seam strength specifications. Recently we redesigned our Primary school blazer pattern by working closely with several preparatory schools to make sure it is the best fit possible. Fabric & Lining Colours are decided by the client and own logo’d linings are available. Many of our fabrics are made only for that school.